India’s Sania Mirza, left, and Rohan Bopanna in a mixed doubles match at the International Premier Tennis League competition in Singapore on Thursday. The top two men’s tennis players in the world are competing this weekend in India for the first time. What they’ll find there is one of their sport’s biggest fan bases. Novak Djokovic and Roger Federer are playing in the International Premier Tennis League, a team-based competition outside the main pro tours that debuted last week. Most players are treating the IPTL as an offseason exhibition, though the winning team splits a $1 million prize. The league spends three days in each of its four host cities. Next up, starting Saturday: New Delhi, the capital of the world’s second most populous country, which is a surprising tennis hotbed. India’s tennis love is surprising because the country has no player ranked in the Top 100 in men’s or women’s singles. It also has no event on the main women’s tour and just one on the men’s, at its lowest rung, in Chennai. But India does have a strong tennis tradition, including reaching three Davis Cup finals. Also, several highly ranked doubles players in the men’s and women’s game are Indian. “For Indians, Wimbledon is one of the biggest sporting events — not just tennis events — of the year,” IPTL founder Mahesh Bhupathi, a retired 12-time Grand Slam champ from Bangalore, told CNN. To measure tennis fandom in India, I checked with Socialbakers, a company that analyzes social media followings. The company supplied the percentage of players’ Facebook fans who are from India. (It doesn’t yet do the same for Twitter followers, such as those who gleefully answered Federer’s call for India-themed Photoshop jobs of his image.) 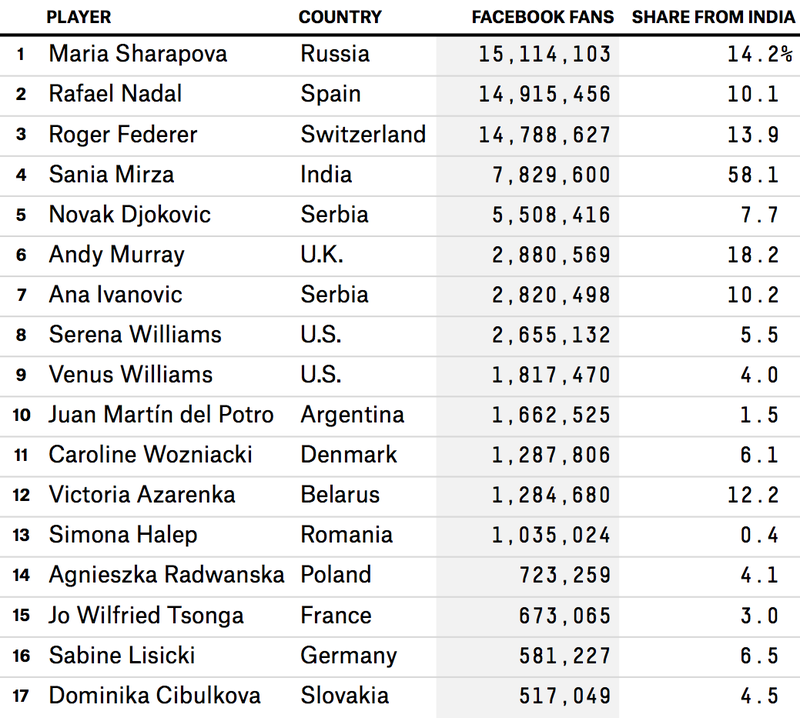 Of Federer’s nearly 14.8 million Facebook fans as of Sunday, 13.9 percent are from India. That’s nearly double the Swiss star’s second biggest fanbase, in the U.S. Djokovic’s biggest stronghold is his native Serbia, but India ranks second, with 7.7 percent of his fan base. India has a natural advantage in its population, the second largest in the world behind China; and in its share of Facebook users, the second largest in the world behind the U.S. Yet other sports’ stars don’t rely nearly as heavily on India to make up their Facebook fan base. Socialbakers counts 19 soccer players with more Facebook fans than Federer. None has as many as 7 percent of their fans in India, and just five of the 19 have more Facebook fans in India than Federer. Socialbakers compiled the number and share of Facebook fans for a list I provided of 66 athletes from 17 sports (if WWE counts as a sport) — the 30 with the most Facebook fans, and a selected group of the highest-ranking athletes from various other sports. Two Indian stars of cricket, the national sport, rank in the top 20, with most of their fans from India. Otherwise, tennis is near the top. Only the WWE, with two Top 30 representatives, and track’s Usain Bolt top the 16 non-Indian tennis players we checked for share of Facebook fans from India. On average, 7.6 percent of the tennis players’ fans are from India — well ahead of soccer (3.7 percent), golf (3 percent), boxing (1.7 percent), the NBA (1.2 percent), the NFL, MLB, the NHL and NASCAR (all less than 1 percent). Non-Indian tennis stars’ share of Indian Facebook fans is nearly as high as the percentage of Facebook users who are in India — impressive for a country that, before this weekend, rarely hosted the game’s very best.